The most anticipated smartphone of 2013 is here. Let's find out if it lives up to the hype. Excellent screen; Superb camera quality; Loads of camera features; Great sound quality; Supports multiple video formats out of the box; Good battery life. Uninspiring design; Flimsy back cover; Noticeable lag in certain basic tasks; Cluttered UI; Uncomfortable for single-handed use; Expensive. Here's a smartphone that requires no introduction. Not just enthusiasts, but almost every person who has the slightest of hint that I work for TechTree, has been asking me about the Samsung GALAXY S4. But to keep up with the fanfare, the handset bring upon itself a challenging task of getting ahead of its overly-popular predecessor. Without further ado, let's find out if the S4 lives up to its hype. "Arey aapke paas bhi gelexy grand hai? ", a co-passenger asked me when I was testing the device. I can't blame him, after all Samsung seems to be unwilling to give a premium feel to its Rs 40,000 phone. As we've seen in the recent times, irrespective of how classy the competing handsets look, Samsung continues to recycle its uninspiring design. Like every other GALAXY phone, the S4 features an all-plastic body. Its sides have a faux-metal finish. From my past experience (yes, it's there on almost every GALAXY phone) I can tell that it goes away over a period of time. Although, the phone has a relatively smaller footprint than most 5-inchers, it's still not ideal for single handed usage. Especially, pulling down the notification bar can be quite an uphill task. And you're required to do that a lot in an Android phone. The S4 has three sensors and a front-facing camera near the earpiece. These four black dots look awful on a white unit. What's worse is that their placement is just as random as pimples on a person's forehead. Hopefully, it would be less pronounced on the black variant. While most Android handset makers are going with the on-screen navigation keys, Samsung has retained the tried-and-tested physical home button and capacitive keys. Among other things, the 3.5 mm jack is at the top, while the micro-USB port sits at the bottom. On the right is a Power / Lock button, and volume rocker is placed on the other side. The build quality is decent, and I bet the handset can withstand a few drops. However, the back-panel is extremely flimsy. Even domestic brands like XOLO use better materials for the back-panels of their sub-10k phones than this "premium" device. The S4's 5" Super AMOLED screen is simply outstanding. It makes colours pop-out and delivers impressive blacks. There's even an option to alter the colour tone of the display. For instance, if you like saturated colours, you can opt for a preset called Dynamic. On the other hand, those who prefer natural shades can go with Standard or Photo mode. The 1080p screen is sharp, but the resolution is not the only reason for its sharpness; you just can't tell the difference between this and a 720p resolution on any 5" display. So basically, the 1080p part is nothing more than a gimmick. But having said that, the screen quality is better than any of its competitors or predecessors. The display is scratch resistant, thanks to Gorilla Glass 3, which is considered to be the best in the business. Similar to the Lumia series phones, the S4 sports a glove-friendly screen. In India, the S4 ships with Exynos 5410 chipset that features 1.6 GHz Octa-Core Processor, and 2 GB of RAM. Other features include 16 GB of internal storage, microSD support for up to 64 GB, 13 megapixel auto focus camera, 2 mp front-facing camera, Wi-fi, A-GPS with GLONASS, NFC, Bluetooth 4.0, IR LED (Remote Control), MHL 2.0, and 2,600 mAh battery. For a quick specs rundown, check out the video at the end of this review. 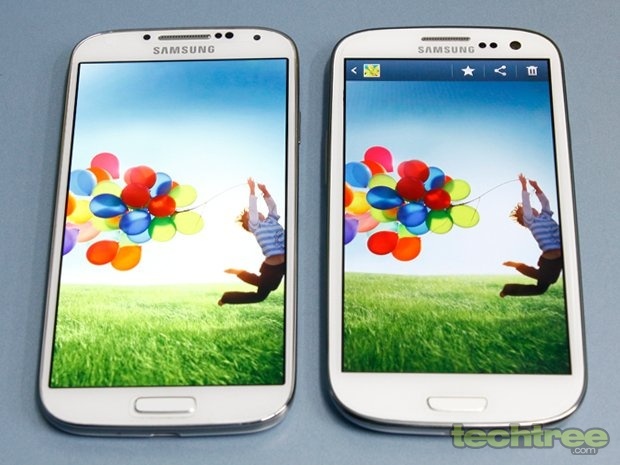 The S4 features Android 4.2 (Jelly Bean) with TouchWiz UI on top of it. The interface is much like what we've seen on the GALAXY Note II. As mentioned earlier in the article, Samsung has opted for its standard buttons over on-screen navigation keys. These three buttons offer secondary functionality with long press. For instance, you can bring up Google Now by pressing and holding the Options key. 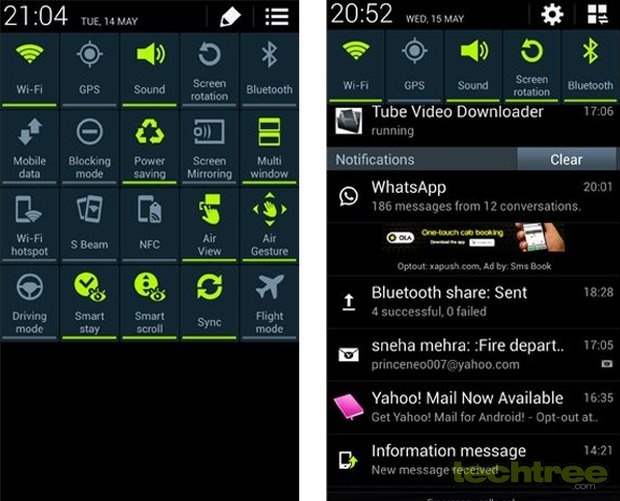 Apart from doing its primary task, the notification bar offers quick access to toggles for Wi-Fi, Network, Bluetooth, GPS etc. There's even a brightness slider, which comes in very handy. Smart Pause: If you look away while watching a movie on your S4, the phone pauses the video player. It resumes when you look back at the screen again. Since this feature requires you to track your face, it doesn't work well in the low-light. Even in well-lit conditions, it seldom works. Smart Scroll: This feature allows you to scroll emails and websites, by tilting your head or the phone. The Smart Scroll doesn't always work as Samsung would like you to believe. More importantly, I fail to see how it's more convenient than scrolling with your thumb. Air Gestures: The S4 lets you browse through picture, change tracks, and pick up calls by waving your hand at it. The phone can pick up these gestures only if your hand is less than 5 cm away for the screen. Now irrespective of its success rate, gesture navigation for something that sits on your palm is pointless! WatchON: Similar to HTC One, the GALAXY S4 features a built-in IR port. Using manual key mapping, you can make it work on most TVs, home theatres, and cable set-top boxes. Now this is a useful feature and quite fun to use too. 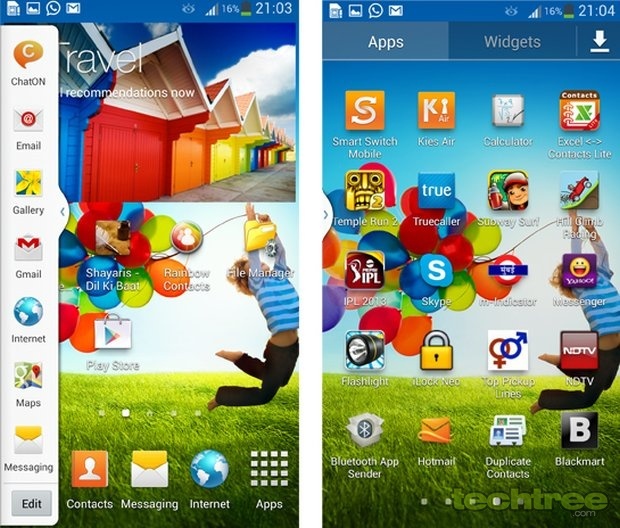 Group Play: Using Group Play, you can wirelessly connect multiple GALAXY S4 phones to play music together. It can also be used for playing multiplayer games. Since we had only one GS4, I couldn't test this feature. Optical Reader: This feature is inspired by Bing Vision found on the Windows Phone devices. It's supposed to help you scan text and translate it. In reality, leave aside translation, the software had a hard time even identifying words. So basically, the phone has no shortage of features. However, except for the WatchON and Air View, none of them are truly useful. Having too many features isn't bad, but functionality that doesn't serve any purpose creates unnecessary clutter. In GALAXY S4's case, Samsung was so focused on adding bells and whistles, that they have overlooked the core UI elements. Some menus are so flooded with options that they end up looking messy. The company's in-your-face icons and colour scheme don't help either. Then there's a complete lack of design uniformity among Samsung apps. Some of them have hierarchical menus whereas few others feature Windows Phone like swipe interface. Comparatively, HTC One delivers a more streamlined and easy-on-eyes UI. Thanks to its insanely-powerful octa-core CPU, the S4 had no issues handling complex 3D games such as Dead Trigger and Shadowgun. Coming to the subject of synthetic benchmark, the S4 tops the list of best performing phone by scoring 27650 in AnTuTu. Surprisingly though, the mighty S4 chokes while performing simple tasks! Weird as it may sound, but the phone takes more than a couple of seconds to load the phonebook. It stutters while scrolling the list of songs and takes an unusually long time to change the screen orientation. Forget similarly priced phones, even the Lumia 520 that sells for Rs 10,000 (one fourth of S4's price) beats the S4 at it. We tested a retail unit, and to make sure the problem wasn't limited to that specific handset, we spoke with a few shopkeepers. According to them, many users have been reporting such issues, and some of them have even returned their handsets. More evidence can be found by clicking this link, where the owners of the S4 (Octa-core version that ships in India) are complaining about the lag. There's no denying that the S4 has the most powerful hardware, but if it isn't good enough to deliver a pleasant user experience in basic tasks, it doesn't impress me much. The S4 comes with a feature-packed music player. It offers usual set of equaliser settings and sound enhancements. There's even Smart Sound that works as a sound normalizer. More importantly, the device's sound quality is great. In terms of video playback support, the S4 covers almost every popular format including AVI, MP4, MKV, and WMV up to 1080p. There's pop up play feature that enables you to watch videos in a small, widget-like window. This allows you to view a clip even while browsing or sending a text message. While watching a movie, you can seek through it by hovering your finger over the progress bar. So overall, the phone doubles up as an excellent PMP. Cinema Shot: This app captures multiple frames and makes the photograph livelier by turning it into an animated image. Once the photo is taken, the app highlights the spots that can be animated. If you're not happy with these suggestions, you can manually select the area via the edit mode. It's just like Cinemagraph feature found on Nokia Lumia phones. Eraser: Assume you're taking a picture of your friend and a stranger unknowingly walks into the frame right when you hit the shutter button. Now generally you don't have an option but to delete that picture and snap it again. However, this feature allows you to remove that "photo bomb". Again, this feature has been lifted from the Nokia Lumia phones. Best Face: If you're snapping a picture and your friend blinks, you've to retake the shot, right? Thanks to Samsung's Best Face feature, the answer is no. Since this mode snaps additional frames, you can select the face and choose the best expression. Once you get the desired results, hit the check button and then save the file. And yes, this functionality is also inspired by the Nokia Lumia phones. Drama Shot: This feature combines multiple images in a single frame to convey the action. This works only when the subject is in motion. For instance, this is perfect for taking interesting pictures of runners or skateboarders. Samsung fans will be glad to know that this feature hasn't been taken from Lumia devices. 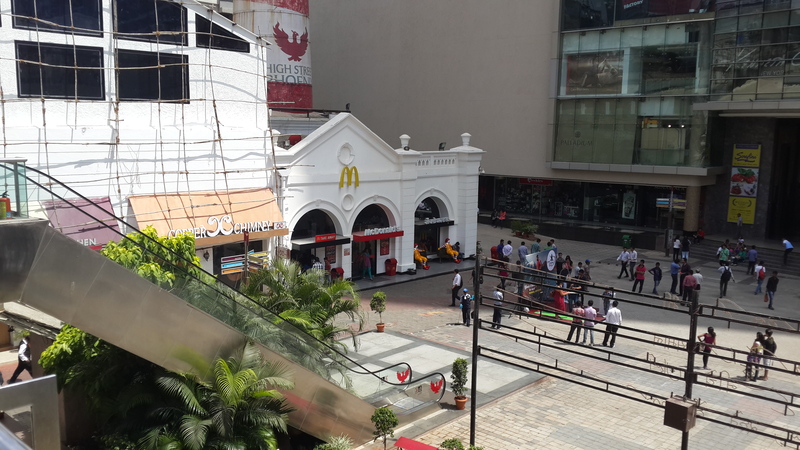 But, did I tell you that it's a clone of HTC's Sequence Shot? Sound & Shot: As its name suggests, Sound & Shot lets you add audio to your photographs. Thanks to this feature, you'll never forget what song was being played or what was being said at that moment. It's definitely a nice way to preserve those precious moments. Dual Shot: This is a unique feature that allows you to take simultaneous pictures using both cameras. The snap taken from the front camera gets stamped on the main image. This way, even though you're pressing the camera shutter, you can still be a part of the picture without using third-party photo editing tools. Wonder why one would need that. Beauty Face: Ever wondered why some people look prettier in their Facebook profile pictures than in person? Well, the credit goes to the Gaussian blur and Smudge effects in Photoshop. 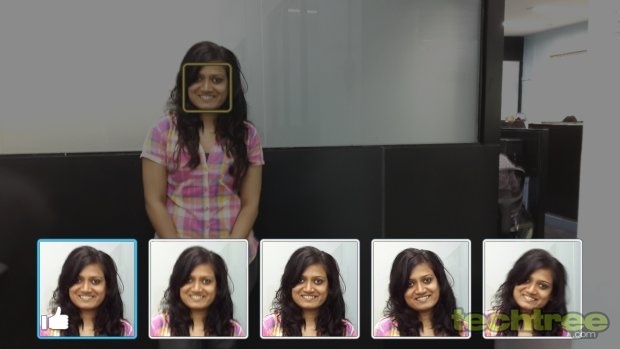 Similar results can be achieved using the Beauty Face mode on GALAXY S4. Those registered on matrimonial sites will find this feature incredibly useful. Innovative or not, one can't deny the fact that the S4 sports a most feature-packed camera. More importantly, it offers great image quality. The resulting photographs contain plenty of detail, while keeping noise under control. It even bests the Apple iPhone 5 and Nokia Lumia 920 in well-lit conditions. Click here, to view the untouched camera sample. 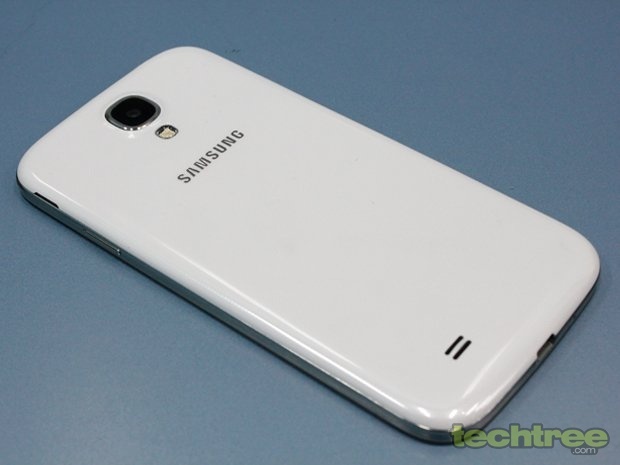 Compared to its predecessor (Galaxy S III), the low-light performance is also good. Long story short, it's the best Android camera phone available in India. Like any other flagship phone, the S4 can record full-HD videos. The clips are saved in MP4 format, and offer smooth playback at 30 fps. You can record slow-motion and time-lapse videos. In addition to that, the Dual Shot feature also works in video mode. The phonebook is a standard TouchWiz affair: Swiping a contact to the left results in composing a message, while swiping it to the right lets you call the person. Thanks to Direct Call feature, holding the S4 to your ear automatically dials the number you were browsing. In terms of network reception and call quality, there's nothing to complain about. 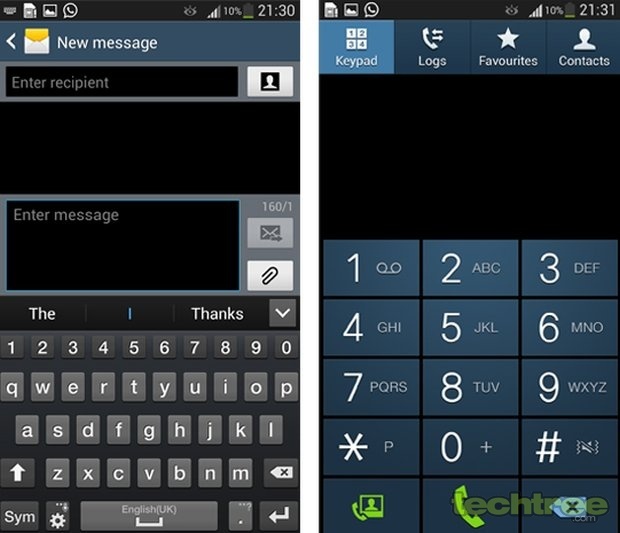 Moving on to messaging, the on-screen keyboard is poorly designed. Instead of utilising the space to fit in bigger keys, Samsung has wasted it in the form of spacing between the characters. The only saving grace here is that you're unlikely to punch in wrong keys on a 5" screen. The S4's packs in a 2600 mAh Li-ion. In our 720p video loop test with brightness set to 60%, it lasted a little over 10 hours. Under normal use, it easily lasts for a day and half. The battery life is nothing short of impressive, given that this phone sports a 1080p display and the most powerful processor in the market currently. 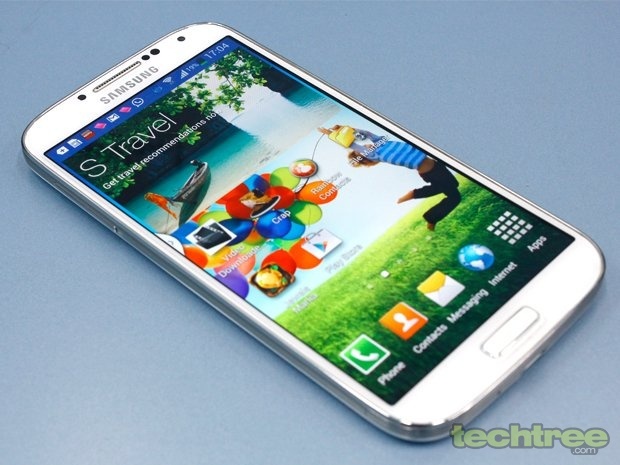 On a related note, available for Rs 26,000, the GALAXY S III gives you excellent value for money. Therefore, for those seeking good value it makes more sense to go for the S III than shelling out 40k for the S4. And even if you do care about flaunt value, the best part is that most of your friends wouldn't know whether it's an S III or an S4. Don't believe me? Check out the following picture. 5" Full HD Super AMOLED (1080x1920), 441 ppi, protected by Corning Gorilla Glass 3. 1.6 GHz Octa-Core Processor, 2 GB of RAM. Android 4.2.2 (Jelly Bean) OS. 16 GB internal storage, microSD support for up to 64 GB. 13 MP rear camera with Auto Focus, Flash and Zero Shutter Lag. 2 MP front-facing camera, Full HD recording @30fps. Camera Features: Dual Camera, Drama Shot, Sound & Shot, 360 Photo, Cinema Photo, Eraser, Night, Best Photo, Best Face, Beauty Face, HDR (High Dynamic Range), Panorama, Sports. Wi-fi, GPS with GLONASS, NFC, Bluetooth 4.0, IR LED (Remote Control), MHL 2.0. Accelerometer, RGB light, Geomagnetic, Proximity, Gyro, Barometer, Temperature and Humidity, Gesture sensors. Other features: Group Play, Story Album, S Translator, Optical Reader, Samsung Smart Scroll, Samsung Smart Pause, Air Gesture, Air View, Samsung Hub, ChatON, Samsung WatchON, S Travel (Trip Advisor), S Voice Drive, S Health, Samsung Adapt Display, Samsung Adapt Sound, Auto adjust touch sensitivity (Glove friendly), Safety Assistance, Samsung Link, Screen Mirroring, Samsung KNOX (B2B only).